With Industry 4.0 becoming a reality and automation gaining ground, the job market is witnessing dynamic shifts. The new global paradigm, driven by the rapid growth of technology, has resulted in an increase in productivity, rise of digitally delivered services and evolution of newer business models. Machine-oriented processes are leading to a new league of job roles and different types of enterprises, creating a range of new opportunities. CII has been driving various initiatives to ensure preparedness for future skill requirements. To achieve the projected economic growth and reap benefits of India’s rich demographic dividend, it is critical to redefine strategy and revisit the existing skills ecosystem to suit the rapidly changing needs of the market. 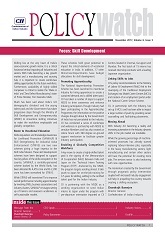 This edition of Policy Watch highlights the emerging trends and challenges being faced by the Industry, identifies the existing and impending skill gaps and the key imperatives required to turnaround Industry 4.0 into a promising opportunity.